Choosing a Colorado hiking trail is no easy task — with millions of acres of wilderness, it's hard to know where to start. For those wanting an easy primer to hiking in Colorado, these five hiking trails through some of the state's diverse terrain are just the ticket. 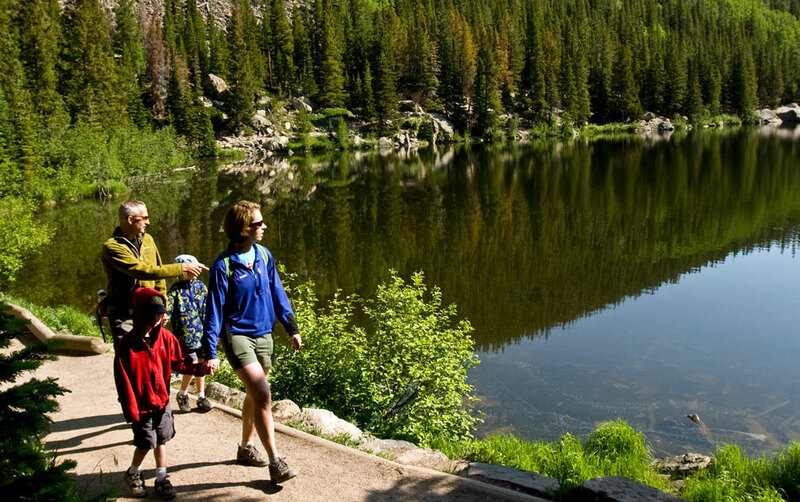 Description: This exceedingly easy Rocky Mountain National Park hike (pictured) loops around small, pristine Bear Lake. It leads through a pine forest and receives quite a bit of snow during winter. Regardless of the season, the protective treeline dampens sound and will protect you from wind and overheating. The towering trees also provide a perfect habitat for a variety of birds, elk and deer. Informational kiosks are located throughout the trail to explain the area’s flora, fauna and geology. 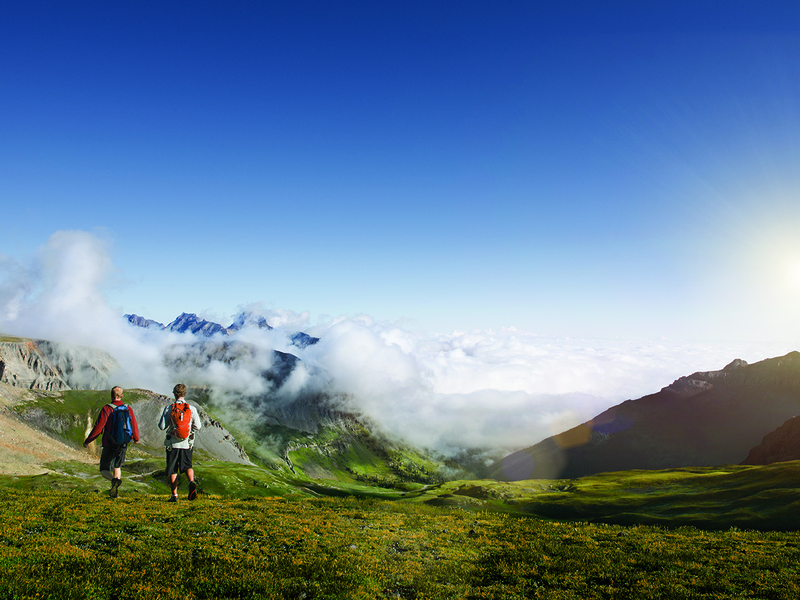 If you’re traveling with young ones, this is an ideal opportunity to let them hike off any pent-up energy. Description: Red rocks spring from grassy fields, birds rush through the crisp blue sky and elk and deer graze within thickets and clearings. These are common sights in Roxborough State Park, just an hour from downtown Denver. This day-use park does not allow bikes, pets or personal motorized vehicles, leaving nothing but the tranquility of unadulterated natural beauty for your hike. The park does operate its own motorized shuttle that takes up to seven passengers on a 2.3-mile ride around the Fountain Valley Trail, where you can experience the sights of intriguing rock formations. The shuttle is a great way for visitors who require assistance getting around to appreciate the park's pristine setting. Description: At the base of Boulder's famed Flatirons, this historic park and scenic area offers activities for everyone from picnicking families to hard-core rock climbers. This trail passes through a big meadow, which sprouts with wildflowers early in the summer and swaying grasses the rest of the year. To tack on a bit more difficulty with an extra mile, continue on along the Bluebell-Baird Trail, which will lead you back to the ranger cottage you started at. Description: This is a relatively easy trail that rises 700 feet by way of a series of well-graded switchbacks. At the top of the rise, enjoy a view of the Grand Valley, including the towns of Palisade and Grand Junction. This trail was once the Colorado National Monument’s original road leading through the park; it is now an often-frequented hike popular with locals looking for a little early morning exercise. The valley itself is home to vine-ripened grapes that are expertly tended to become bold area wines. Description: This easy trail follows a section of the scrub-oak-covered South Rim and provides vistas deep into the dark canyon and the Gunnison River flowing below. Pinyon pine and Utah juniper are prevalent, and informational signs provide facts about the unique and colorful surrounding geology. Look to the brush for songbirds and keep an ear trained for their melodies. Description: The Pawnee Buttes Trail is 1.5 miles of bird watching at its best. Both hawks and falcons call this area home, and seeing these raptors circling the skies and riding thermals in search of prey is a treat often witnessed. Of course, a constant sight rising from the broad prairie is the Pawnee Buttes. At nearly 300 feet high, these sandstone rock formations tower over the arid plains and define the landscape of the trail.